This recipe was barely adapted from Paula Deen. If you're familiar with Paula Deen, she loves her butter, cream, sugar and all those indulgent ingredients we should take in moderation. The original recipe called for 2 cups of sugar for the filling, however cutting back 1/4 cup helped cut back on the sweetness. To me, they were perfectly balanced with sweet and tartness! What I'd like to do next is make this using other citrus juices like lime, orange, tangerine, etc. Preheat oven to 350 degrees F. Lightly grease a 9 by 13 by 2-inch pan. Make the crust by combining the flour, confectioners' sugar, and salt in a large bowl. Cut in the butter to make a crumbly mixture. Press the mixture into the prepared pan. You may need to dip your fingers into a little flour or confectioners' sugar to keep the dough from sticking to your fingers. Bake for 20 minutes. Meanwhile, to make the filling, mix the eggs, granulated sugar, flour, and lemon juice. Pour this over the baked crust and bake for 25 minutes longer. Sprinkle with confectioners' sugar, if desired, when the bars are done. The bars look cute ad gorgeous! Love the simple and quick to bake recipe. Eager to make these citrus beauties. 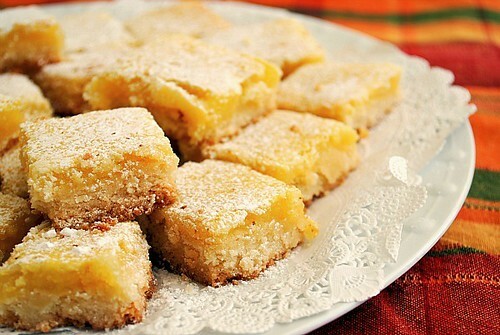 I love a good lemon bar. The cookie crust and the sweet and tart filling. These look delicious! I have to admit, I've never been a huge lemon bar person though they are a staple when it comes to holiday baking in my family. I do love the lighting in your photo though. Simply gorgeous! I'm so sad to say these were a cosmic failure for me:(!!!!! I don't know what the heck happened. I'm a pretty good cook, but these just didn't work. I was so bummed!